Quinta Quinoa is the first locally sourced, high-quality quinoa to be produced and processed in Ontario, Canada! Quinta is the only quinoa on the market that can make the 6 nutrient content claims for being high in protein, zinc and fibre, an excellent source of iron and magnesium and a source of calcium. Start by adding the eggs to a small saucepan with 1 inch of water in the bottom. Bring the water to a boil, cover the pot and reduce to simmer for 5 – 6 minutes. While the eggs are cooking, add all the pesto ingredients to a food processor. Process until almost smooth (no large chunks wanted here!). When eggs are done cooking, rinse them under cold water to stop the cooking process. Let stand in a bowl of cold water for 5 minutes. 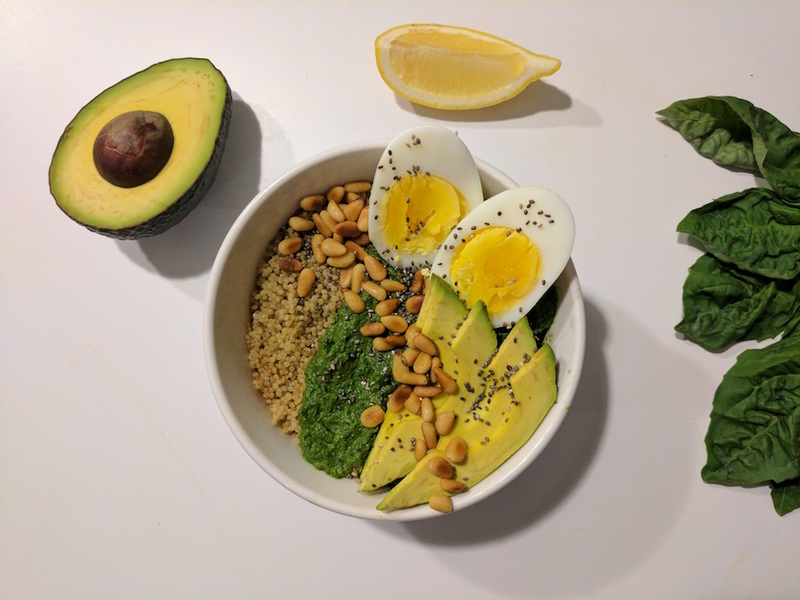 Prepare your breakfast bowls: add 1 cup quinoa, half of the avocado thinly sliced and half the pesto. When eggs have cooled, peel them and slice in half. Add to the bowl and sprinkle with half the hemp and chia seeds. Enjoy as is, season with a touch more salt and pepper, or mix it all together.